I think staking tomatoes used to be a medieval torture treatment. Basically you need to string 4 lines of twine along side of every tomato. 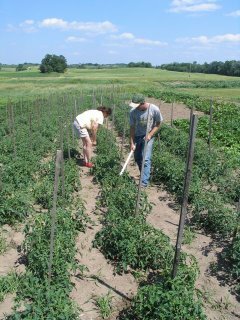 You do this by extending a line under the foliage of the plants and tighten the line around each stake. And you try to do this without knocking off any little tomatoes or blossoms! Striped Cucumber Beetle – most hated insect ever! 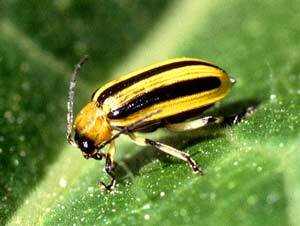 Enemy number one: Striped Cucumber Beetle. This guy is really making my July tough. I’ve been battling this bug since early June, but it has really exploded since early July and is really insult to injury in our dry conditions. They like anything in the cucurbit family which includes all melons, squash, and cucumbers. Right now they are eating all blossoms and crewing on the fruit of the plants, especially the zucchini. I have been treating the plants with a substance called PyGanic, which is an organically-approved (OMRI) insecticide made out of Pyrethrin, a natural insecticide made from a plant. Still the battle is not as successful as hoped. I am now tossing out about 1/3 of all summer squash due to insect damage. So, if you see some little pock marks on a zucchini, sqush, or melon throughout the season, you now know the culprit. But don’t worry, it’s only cosmetic. 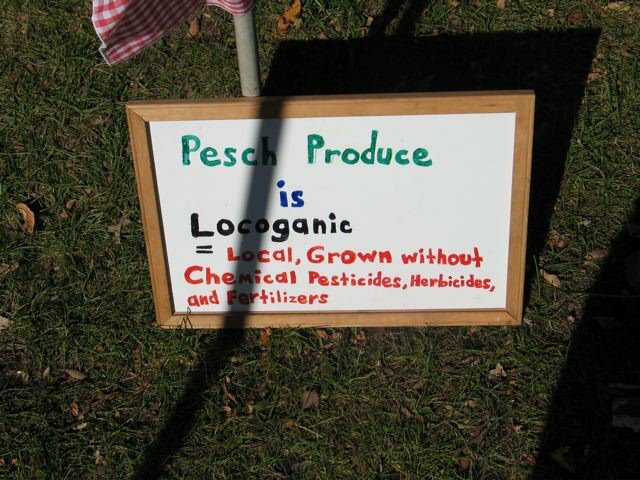 It seems kind of strange to write about the history of Pesch Farm and Produce since there is so little of it, but I thought you’d like to know how we got here. 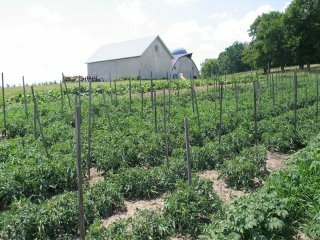 We hightailed out of St. Paul and moved to our farm halfway between Pelican Rapids and Vergas two years ago. I’m originally from East Grand Forks and Mar’s from Lake Elmo, so we lucked out in landing halfway between both our families. 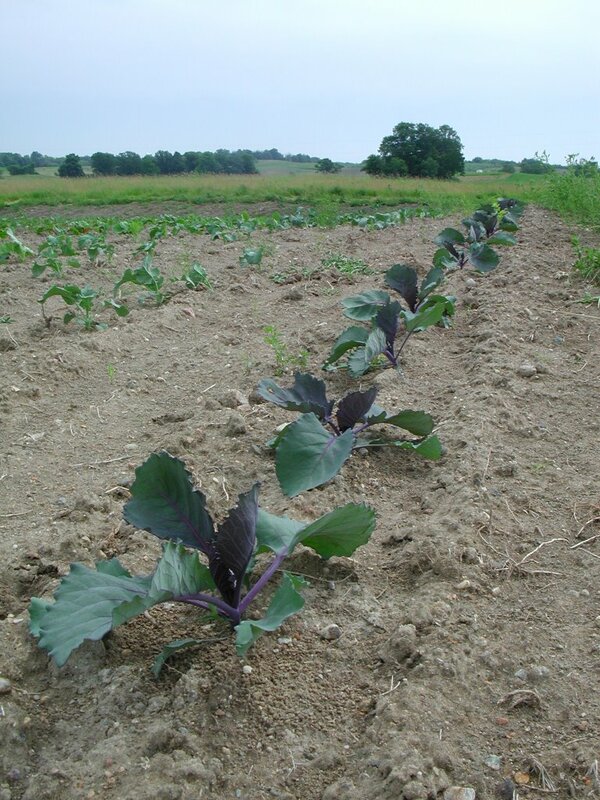 So how did you get into vegetable farming? Some 6 years ago I was a kid out of college living in St. Paul. 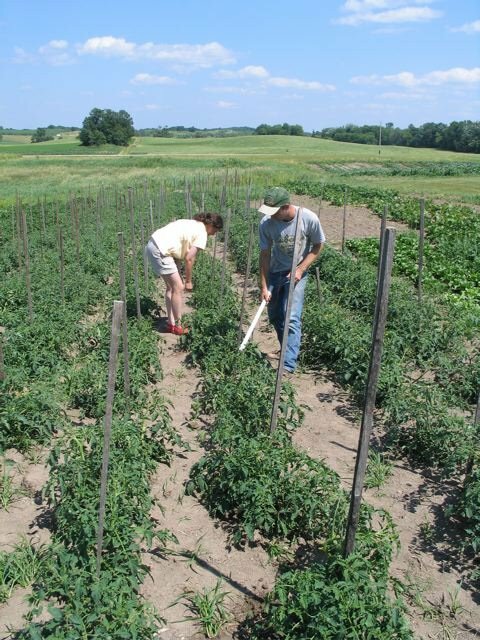 After a stint in a law office shuffling papers and realizing just how boring the real world of employment actually is, I decided to make a sharp left turn and find an apprenticeship on one of the many local organic farms in the “vegetable belt” around the twin cities. I ended up working for Paul and Chris Burkhouse of Foxtail Farm for two seasons before Mar and I got married. At Foxtail I learned all there was to managing a produce farm and CSA (community supported agriculture). In 2002 Mar and I did a “dry run” on our own. We were tenants on her uncle’s land in Lake Elmo and sold at the Northeast Minneapolis Farmers Market. Also at the same time I worked at Mississippi Market Food Co-op in St. Paul as a greengrocer, a job I had until we moved up to Otter Tail County. So, for us, being able to afford a small farm and actually start up our own place is a dream come turn. It’s been a long road, but we’re happy to be here. I’ve decided that we have really turned a corner with how people view what they eat. For a long time only a small group of folks were talking about the importance and pleasure of buying fresh and local food. Not only is a local head of lettuce about 100 times fresher than the three-week old head of Iceberg, but you encounter a huge variety of produce, support local farmers, and learn a lot about your local community in the process. But two articles have changed my view. 1. Wednesday the Star Tribune ran a series of articles on the ethics of buying food http://www.startribune.com/438/story/547730.html 2. Today I read an article on Wal-Mart bringing organic foods to their stores http://adage.com/article?article_id=110482 When Wal-Mart joins in, you know all this talk about organic and local foods is no longer relegated to crunchy people who hang around health food stores! This is big. In our own small way we’ve seen this at the little Lakes Area Farmers Market. The number of people shopping is up from last year as is the number of vendors selling. Sometimes we just think we’re a backwater–a bit behind the times–but, on this, we are right in the mix. We’re growing our own local food system right here. Well, already another market day is upon us. The week has just whizzed by and tomorrow is already Saturday. Green garlic (just hasn’t been dried or cured yet): it’s just more flavorful and with a little kick.